Downeast Community Summer Sailing Series is a collaborative project of Washington County Community College's Outdoor Adventure Center and the Passamaquoddy Yacht Club. This series offers a series of community sailing programs for youth this summer! The new programs are funded in part by a generous donation from the members of the Passamaquoddy Yacht Club. All sessions are led by US Sailing certified instructors. Scholarships are available through the generous support of yacht club members! This is a beginner class for children to have positive early learning experiences on the water and while sailing. Building confidence, ensuring safety, demonstrating respect, courtesy to others, and good teamwork are primary goals. Participants learn basic nomenclature, seamanship, and sailing skills. Small sloop-rigged dinghies called “Mirrors” are used for instruction on fresh water lakes. Fun sailing games and other skill-related activities are incorporated into the course. Upon completion students should feel comfortable sailing with another participant. There are two locations and dates for this program. Maximum class size 12 students per session. This is an intermediate class for children who have taken our beginner program (see above) or have participated in a sailing training program before. It is the goal of this program to build upon the introductory skills learned previously and to build confidence. Participants will revisit basic nomenclature, seamanship, and sailing skills while learning more intermediate skills such as maneuvers, sail theory, navigation rules. Small sloop-rigged dinghies called “Mirrors” are used for instruction on fresh water lakes. 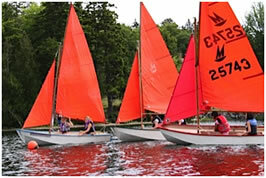 Fun sailing games and other skill-related activities are incorporated into the course. Upon completion students should feel comfortable sailing with another participant. Maximum class size 12 students. This course is intended for youth who have completed 2 years of sailing school or possess skills beyond beginner level. This program will focus on skill development for teens using mirror sailboats, daysailers, and/or WCCC’s fleet of six Flying Junior sailboats and will provide the participant with instruction in more advanced topics such as boat rigging, furling, safety, and racing. The class further focuses on sailing skills, such as roll-tacking, roll-jibing, getting out-of-irons, heaving-to, points of sail, sailing upwind, downwind, weather and wind awareness and advanced safety such as right-of-way. A review of important knots and variety of uses will also be included. Actual sailing time may include both lake and ocean time. The curriculum is based on US Sailing’s standard small boat sailing certification program. Maximum class size 12 students.